Sssh! Don't make a sound! for a classy meal before or after your classy snoozing the night away here is... and we love it because fresh fish is the name of the game here. Gamba knows how to deliver, as well! Make sure you check out the specials of the day, which vary depending on what's been caught. This little golden oasis promises meals to be long remembered. 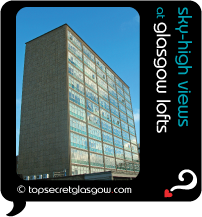 ... so do you want to know what's keeping those 'in-the-know' folks talking about Glasgow Lofts? It's... those massive windows! A head for heights might well be called for, staying here. Literally from floor to ceiling, the views are nothing short of panoramic... Enjoy! Enjoy! Now... don't tell anyone else. And DO NOT reveal this Glasgow Lofts top secret file and password. We'll know.... And we'll track you down and sneak little sticky "eejit!" labels onto your back! And get yourself onto the VIP list below while it's still open, and I'll drop you a short email every time we reveal something new about Glasgow Lofts. for a classy meal before or after your classy snoozing the night away here is... and we love it because the style of the classic old Buttery has been retained, without the starch! Amazing 'Two Fats' cuisine is matched by attentive service in one of the most elegant dining rooms in the city. And remember you can grab your own page here to share your tips, photos and stories about Glasgow Lofts. Have fun! Great news! Finding this page means you can now join our VIP list for Glasgow Lofts. You found the Top Secret File for Glasgow Lofts. If you don't have a password yet, there are still lots of great things about Glasgow Lofts in its Buzz Page. ("The Buzz" page is also the place to pick-up the password by taking part). public Cambridge Street (LLP) in the hood! Welcome to Glasgow Lofts is arranged in advance, when making a reservation.